This two-day bilingual (Spanish and English) program provides farm trainers with knowledge and skills to effectively deliver pesticide safety training for pesticide handlers and agricultural workers as mandated by the state and federal Worker Protection Standard regulations. 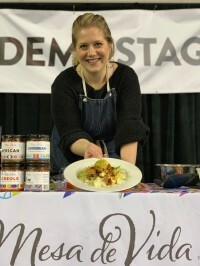 Chef Kirsten Helle Sandoval is the founder of Mesa de Vida Healthy Global Gourmet. Mesa de Vida is proud to be a 100% woman, minority owned and operated family food business. Kirsten is a personal chef to professional athletes and high profile clients and has worked for several of our local Super Bowl and WNBA Champions. Kirsten has been on The Food Network, and the cover of Woman's Day and Woman's World magazines, sharing her passion for healthy cooking, and her inspiring story that started with her setting out to create a healthy family legacy, and accidentally to losing over 100 pounds. 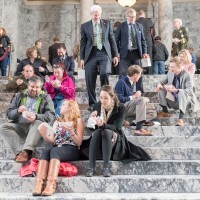 This week potato farmers gathered in Olympia meeting with state legislators, staff members, and agency personnel. Family potato farm perspectives were shared, communicating various challenges, and expressing the need to fund soil health research. 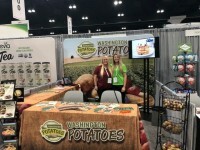 The 2019 WA/OR Potato Conference and Trade Show is here! Don't miss your chance to win an all-expense paid trip to the 2019 Washington School Nutrition Association conference in Spokane! WSPC Commissioners and staff members had a blast, serving FREE baked potatoes in the Field House at the 2019 Apple Cup! The hungry crowds loved our product and were able to head over to the game with warm full bellies on the snowy evening. Columbia Basin Technical Skills Center (CB Tech) located in Moses Lake held their fourth annual “Potato Day”. This year potato day was extended into a 3-day event. approximately 1,600 fifth grade students from the Moses Lake, Soap Lake, Royal, and Othello school districts came to participate. Without a doubt, potatoes are a great option for athletes, health enthusiasts, or on-the-go families. Check out the Potato Monthly Food and Nutrition newsletter below for more information on nutrition science, food policy, labeling and safety. Don’t forget to stop by the Moses Lake Museum & Art Center for the Reheated: Baked, Mashed or Fried Potato Art Show. This gallery is a revamp from the museum’s previous annual potato art show “Baked, Mashed or Fried”. French Fries often get a bad reputation and are labeled as non-nutritious food. We are here today to prove that reputation wrong! According to the U.S. Department of Agriculture, French Fried potatoes can be apart of a healthy diet when eaten in moderation. Just like any other form of potatoes, French fries deliver important nutrients like fiber and potassium. This upcoming September 8th hop in the car and head to Columbia Park in Kennewick for one last summer road trip. Take your kids to a fun and education filled event at Riverfest 2018! Riverfest 2018 helps to educate parents and kids on how navigation, irrigation and power help run the dams that are so important to our agriculture process. This week, WSPC staff traveled to Los Angeles, California for the Western Food Service and Hospitality Expo. The three-day convention featured everything from healthy foods to coffee. Staff members were able to speak with chefs, distributors, restaurant owners, school system employees, and TV show hosts. 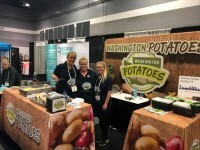 WSPC staff passed out free potato peelers, recipes, and information to over 6,000 people!